In this section we secure the APIs we have just registered, using API Manager. To do that, we use API key, probably the most common protocol when exposing APIs to external developers, for the purpose of developing mobile apps for example. Time to complete: 5 min approx. User role: API manager or Security manager. Difficulty: low. For the corresponding video, click here. Other possibilities include HTTP basic authentication and OAuth, either with the gateway acting as an identity provider, or with an external identity provider. 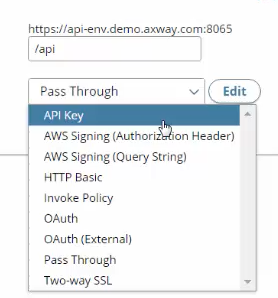 Or you could use AWS authentication (using an authorization header or query string). Or again you can choose 2-way SSL, often used for B2B integration. Remove credentials on success (yes or no) : the advantage of this selection is that it avoids forwarding the API key to the back-end. We have now authenticated the front-end API. It is also possible to authenticate the back-end API, against an Identity access management system for example. We won't be covering this option in the context of this tutorial: please contact us if you need further explanations. In the next section >>> , we take a break from clicking on the interface, and read an example illustrating the virtue of providing faster cycles of innovation, based on a dialog between two members of the digital ecosystem.